Can Christians and Muslims get along? According to that COEXIST bumper sticker, this should be easy, but one does wonder whether it is really possible. In this French film, based on real events from the 1996 Algerian Civil War, we do see Trappist Monks living peaceably, happily, with Muslim locals; sadly, they are not left alone. The film opens with a passage of Scripture, Psalm 82: 6 - 7: “I said, ‘You are ‘gods’; you are all sons of the Most High.’ But you will die like mere mortals; you will fall like every other ruler.” It’s those rulers, the men who think they’re gods, that are the problem. But the Civil War comes to Atlas Abbey of Tibhirine near Médéa, Algeria. Someone tells the monks about a granddaughter who was killed for reading. They promise to pray for the family. At a nearby construction site, Muslim rebels kill all the Croatians, letting other locals, Muslims, go free. The military offers the monastery protection from the terrorists, but the monks refuse protection. They do not want soldiers with guns on the grounds. “In this time of violence… Let us turn to the man of sorrows.” When the military leaves, the monks celebrate Mass. The local authorities suggest they should leave and Christian, the leader of the monastery concurs. Another says, “We were called to live here.” So they remain. They meet Brother Christian, who won’t allow them to bring guns into the monastery (“This is a house of peace”) and amazingly, they comply. The terrorists have a wounded compatriot who needs medical attention. And the monks provide it. Word of the incident reaches the authorities. “You’re very indulgent with the terrorists. Rumor has it you are shielding them in the monastery.” The Trappists refuse to take sides. The monks take a vote about whether to stay or leave. Christian says, “Our mission here is not finished. God set his table here for His friends and his enemies.” All vote to remain. 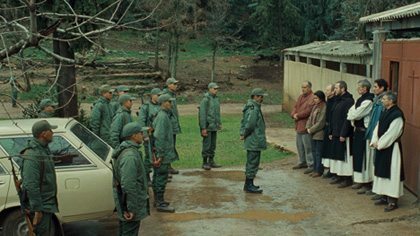 In the end, terrorists abduct the monks. It is not known who, exactly took the men away in a midnight raid. They face death, believing they have chosen eternal life. 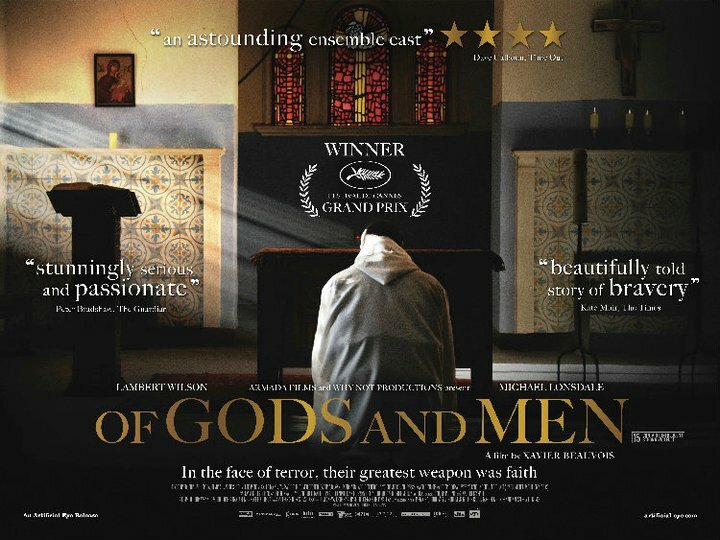 Like last week’s film, The Mission, Of Gods and Men competed at the Cannes Film Festival, taking home the Grand Prix (second place prize). 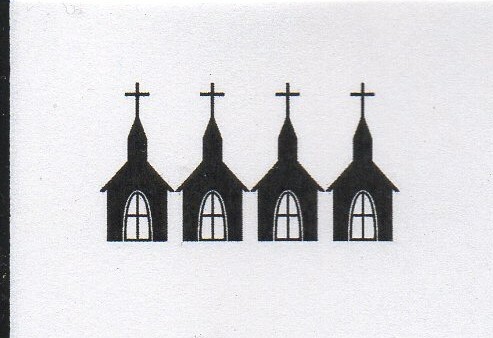 But for their devotion to God and their neighbors, Movie Churches is awarding the Trappist monks of this film Four Steeples.